Hi everyone, now that the contest at Nail Polish Art Addiction is over I'd like to show you what would have been my second entry. In the end I decided to submit the citrus mani because I thought it was more fun and complete and I was happy to have made the right choice after I saw several other sushi entries from other contestants (beautifully executed though!). Unfortunately my entry wasn't good enough to win any prize at all, hahah. Oh well, you can't have everything! But thanks so much if you did vote for me :) Have a nice day! Jammer dat je niet gewonnen hebt! I think this would have held up well against the other sushi manis it came out great also now im craving sushi!!! This is awesome!!!! I really have to try this out! this mani is very well done! i totally would have voted for it! Adorable! I agree with the above comment, I would have totally voted for this design! Aw, cute! I really like the citrus mani though, it's what brought me to your blog! love it. you have skills! you are so good at nail art!! I loved your citrus design, you pick the right one to enter especially since there was other sushi manicures. Great job Jane!! I don't like sushi (i know, who doesn't like sushi?! ), but if I see this I wanna try it again! 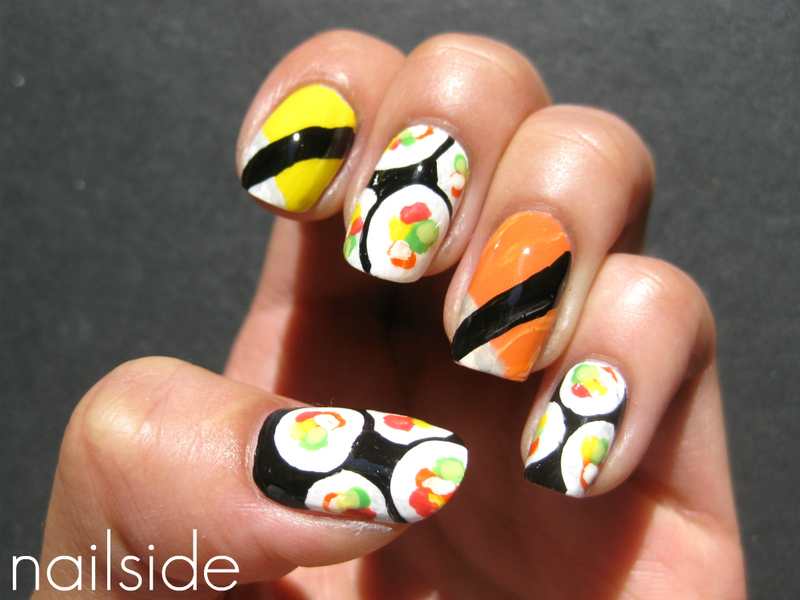 By far the best sushi nails I've ever seen. You're a nail goddess! very successful combination of colors.....love it ! I know I'm late to the party but waaaay cool! Sushi is my fav food and I've seen a number of sushi manis and this one is very very good!